HARLINGEN — They came, they dug and they laid. 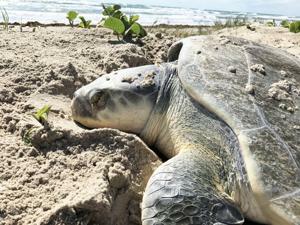 The first big day of sea turtle nesting season on Texas beaches Monday resulted in 41 total nests confirmed from San Jose Island near Rockport south to Boca Chica Beach. On South Padre Island, Sea Turtle Inc. reported 13 turtle nests confirmed, along with an additional two nests on Boca Chica. At Padre Island National Seashore, 22 turtle nests were discovered on Monday inside the National Park Service boundaries. Two additional nests were found on San Jose Island, one on North Padre Island to the north of the national seashore and one found on Mustang Island. All the nesting females are critically endangered Kemp’s ridley sea turtles. A juvenile loggerhead turtle was rescued on North Padre Island and taken to the Animal Rehabilitation Keep (ARK) in Port Aransas. Donna Shaver, chief of the Division of Sea Turtle Science and Recovery at Padre Island National Seashore, said an additional two nests were found yesterday taking the early toll this season to 52 Kemp’s ridleys for the entire Texas coast. It is possible, she said, the high number of cold fronts which have occurred in South Texas this spring have pushed back the typical dates for turtle nesting. “The nesting season in Texas has been documented for Kemp’s ridleys through mid-July, the 15th of July, but the majority of nests are found through the third week of June. So we have about seven weeks left in the peak part of the nesting season,” she added. A total of 27,000 Kemp’s ridley nests were recorded last year along the western coast of the Gulf of Mexico. Practically all of those nests were found on Playa de Rancho Nuevo in Tamaulipas, Mexico. In Texas, 353 Kemp’s ridley nests were recorded last year, with the national seashore marking 219 nests, South Padre Island recording 70 and Boca Chica coming in with 23. Sea turtle females don’t necessarily nest every year, which is a complicating factor in attempting to assess a species’ total number. Shaver has said previously the latest research shows Kemp’s ridley females are nesting every 3.5 years on average.